A shopkeeper stabbed to death in a robbery at his newsagents in north-west London has been named. Ravi Katharkamar, 54, is thought to have been attacked while opening Marsh Food and Wine in Pinner at about 06:00 GMT on Sunday, the Met Police said. A passer-by found Mr Katharkamar collapsed inside the shop. He died about 45 minutes later. 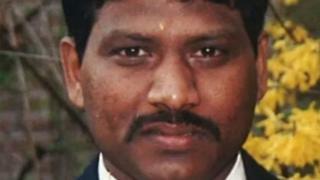 Police said the attack on "completely innocent" Mr Katharkamar was "vicious and unwarranted". Detectives said the shop's till was stolen and may have been dumped somewhere by the robber. No arrests have been made. A number of appeals have been launched to raise money for Mr Katharkamar's family. Journalist Caron Kemp, 36, has set up a GoFundMe page, while 31-year-old Kristina Bennett, who organised another appeal, said Mr Katharkamar's death had "shocked us all". She added: "He was always friendly and polite. Pinner is a lovely place... I am hopeful that everyone will pull together to help the family in whatever way they can." Det Ch Insp Simon Stancombe said: "This was a vicious and unwarranted attack on a completely innocent man. "Ravi's attacker got away with a few pounds worth of coins, but he leaves behind a family utterly devastated."